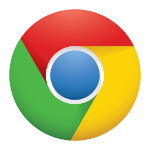 In February of 2011, Chrome had achieved a 10% market share, nearly doubling their consumer usage in just one-year’s time. In fact, of all the web browsers Chrome is the only one that is consistently seeing steady user increases and has been for two years now. Then, by August of this year, Google chrome announced that they had quickly reached 30 million users, placing them in an elite group of one of the top three web browsers worldwide. While Internet Explorer and Firefox are still said to be in the lead, the gap is closing quickly and many people are curious about how they achieved such a high percentage of the market share so quickly.